Samsung HW-K950 Sound Bar System. A surround sound speaker system means five, six, or seven speakers plus a subwoofer. In addition to selecting the number of speakers (or channels) you want for a surround sound system, you need to select the type of surround sound speakers you want. There are three types to choose from, direct-radiating, bipole and dipole speakers, and each type produces different surround sound effects. Your decision should be based on your room and your listening preferences. 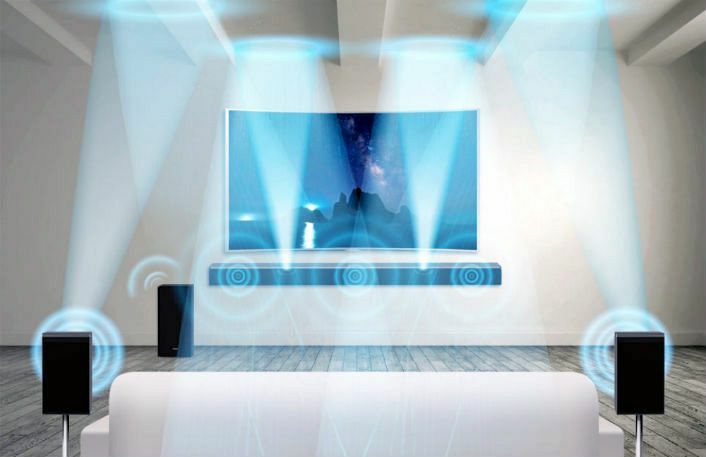 A direct-radiating speaker outputs sound directly into the room toward the listeners. Surround sound effects in movies, music, and games are most noticeable with direct speakers. In general, most people prefer direct speakers if they listen mostly to multichannel music. Direct speakers are placed at the sides or rear of the listening room behind the listeners. Bipole surround speakers have two or more speakers that output sound from both sides of the cabinet. If used as side-surround speakers, the sound is output both towards the front and rear of the room. If used as rear-surround speakers, they output sound in both directions along the rear wall. The dual speakers used in a bipole speaker are in phase, meaning that both speakers output sound simultaneously. Bipole speakers create a diffuse surround effect so the location of the speaker cannot be pinpointed. In general, bipole speakers are a good choice for movies and music and are usually placed on the side walls. Like a bipole speaker, a dipole speaker outputs sound from both sides of the cabinet. The difference is dipole speakers are out of phase, which means that one speaker is outputting sound while the other is not, and vice-versa. The purpose is to create a very diffuse and enveloping surround sound effect. Dipole surround speakers are usually preferred by movie enthusiasts and are also placed on the side walls. In addition to considering the guidelines above, some speaker manufacturers such as Monitor Audio and Polk Audio have made your decision a little easier by including a switch that allows you to select bipole or dipole output on the surround speakers. Denon even provides dual surround speaker switching on some of their AV receivers so you can use two pairs of surround speakers, direct and bipole/dipole and switch between them for movies or music. What Is Surround Sound Audio?